This post is going to explore what expert business “transformation” management is all about and some great insights into how to manage a business. Have you heard of the concept of “Gap Analysis”? Gap Analysis is a great concept to use when you are in business and understanding what you need to do to grow your business. To grow any business its all about numbers. These numbers include leads, conversion rates, total income, gross margin, net profit margin and more. Knowing the numbers for your business is where growing it by improving on numbers begins. Good management is therefore about knowing your business numbers. That’s where the gap comes in too, because when you measure a number often it indicates a weakness or an opportunity to improve it. So a gap is formed between where it is and where you’d like it to be. In this newsletter we’re going to look at how businesses would be managed expertly and by doing so you’ll be able to see where you are in response to that and therefore create a gap with which to work on to improve your management skills. Management is an extremely broad subject. And “Manager” is a title that is all too easily handed out to employees in businesses. By reading this you might see why this is so. In this post we’re going to be talking about a General Manager, not a manager of a section in a business. Not an office manager, or a production manager, or a project manager, or administration manager, but a General Manager – i.e. the person who runs the whole business, so the owner doesn’t need to work in the business at all. By the way, probably about 98% of all SME’s operate without a person employed as a General Manager so that means the business owner is operating in this role. So let’s begin this subject of management. First of all, management is – where the buck stops. If a manager (or business owner if they don’t have a general manager) is running a business, then they are fully responsible for what happens while they are managing it. That means if sales are down the manager is responsible for doing something about it. There’s no other person for them to pass the buck to. If available cash is down it’s the manager’s responsibility to do something about it and get some in. If someone needs to be put off or hired it’s the manager’s job to carry that out. The manager is only as good as the information they have available to make quality decisions to keep the business profitable and growing and away from major challenges. In any business there is a need to bring in customers (call that sales), to do the work for the customers (call that Production) and get paid for the work done (call that Cash flow or cash in). How balanced all 3 of these aspects of the business are each week is what the first priority of management needs to be. You could consider these 3 aspects as being like a 3 legged stool. All 3 legs need to balance and if they don’t the business can fall over. If you get too many sales for your capacity to do work, you will have a challenge. If you don’t have enough money coming in for work done, you also have a challenge. All 3 aspects of Sales, Production and Cash flow are equally important in a business. The wise saying of “You can’t manage what you haven’t measured” is very appropriate here. So first of all, expert management is about measuring what’s going on in the business on a weekly basis in these 3 areas. The majority of all small and large companies manage the business on numbers, but only with 1 set of numbers of the 3 areas … finances. The finance side of the business happens only after the sales and production processes have been completed and invoices have been issued. For a very large proportion of businesses (especially service and manufacturing) the time frame from initial phone call that turns into a quote, then a sale, then work pending, then production, then invoicing and finally the payment of the work can be many weeks to many months. So if these businesses are only measuring finances, they are many weeks to many months out of touch with what the business is actually doing at any time. If you are only managing your business by cash in the bank, or P & L’s monthly or quarterly, you can be bankrupt weeks or months… before you even know it! Measuring Sales, Production and Cash flow weekly, is what expert management is all about. But there’s more to management than just measuring, in fact measuring is just 1 of 3 skills you need to develop and master for expert management. There are 3 primary skills to learn for management of a business and they are, measuring, people skills and systems. When you master all 3 of these skills you will have a business that works smoothly and completely without you being there, at all! Real synergy happens with all 3 skills when they are all applied in any business. Look at McDonalds as they are a great example of this. The company started out with expensive chefs cooking burgers and meals. Then by measuring they developed systems, which their staff became by-products of, so much so that teenagers now run multimillion dollar businesses with a 20 year old manager while the owner never comes in to work. The Net Profit Margins is usually extremely high too, over 20% plus! So let’s look into these 3 primary skills of management and see what they include. Did you think like this when you first started out in business? No one thinks like this! Yet there is sound logic in this line of thinking. Your skills with people determine the level of stress, frustration and profit you experience from your business. Do you endure constant stress from your business, or get frequently frustrated with people, especially your staff? If so, that’s a sure sign your people skills aren’t highly developed. Your ability to get along with people, but more importantly to influence them, determines the profit and quality of life you enjoy as a business owner. The good news is; you can significantly improve your people skills rapidly, if you’re willing to learn how. This brings up your relationship to yourself, another skill if you like. How resistant are you to learning new skills such as measuring, people and systems? Your resistance to learning, developing new habits and taking action on what you learn is a skill in itself. Discipline is a habit or skill. You can enhance it so greatly by stopping saying, “I should…” and start taking action. This one thought can transform your life and business… guaranteed! How many times have you thought, “I should work on my business more”, or “I should update my website”, or “I should call that client who owes me money”, or any other thought that relates to turning procrastination into decisions and actions? Stop “Shoulding” on yourself and get into “Have to” mode, it will change your life! Notice when you think, “I have to…” you actually get stuck into doing whatever it is? Another people skill is selling as a skill. Almost no one (business owners) gets professionally trained in how to sell, because they falsely believe one of two things, “I’m not a salesperson, I just give people quotes/prices” or “I don’t want to become a pushy salesperson by being trained”. Both of these are complete myths about what learning about selling is about. Selling is the art of asking questions to help potential customers realise what they want to buy, based on their own buying criteria. The more questions you ask before “telling” customers your opinion the better the salesperson you are. So next time you are in front of a customer, watch how quickly you either give them your opinion (statement), or go into answering questions to answer their questions. Did you know the person who asks questions is the person doing the selling? So if you are waiting or simply answering a person’s questions, you are relying on them selling themselves, when they are ignorant of what they truly need, because you’re the expert… not them! Selling skills is a phenomenal skill to have. It empowers you to sell far more products/services AND at higher prices/margins! Dozens and dozens of our clients have put their prices up by 30-50% in a space of 6 months AND increased their conversion rates at the same time! Most people think this is impossible, but not the ones who just watch it happen before their eyes, proven by numbers. These were the ones that were sceptical too, until it happened to their own business. Another great skill with people is influence. This skill is used with staff, with suppliers and with customers, even after the sale has been won. Few people understand or appreciate let alone fully develop this skill, yet it transforms a business rapidly when learnt. One of the most powerful and beneficial people skills you can learn in business is one of rapidly determining attitudes of people, especially staff. Attitudes are misunderstood in business. Many business owners don’t quite clearly understand this word, they assume they do, but the reality is they don’t. Many business owners have average or poor attitude staff, yet don’t realise that’s why they have a lot of frustration with certain staff. Staff with great attitudes don’t need to be told what to do, they think for themselves, they anticipate what work needs to be done and go and do it. They never stand around wondering what to do. Great attitude staff don’t need to be asked twice or reminded to do the same job again and again. They remember what is required of them and do it, because their mind and heart are on the job. Can you pick great attitudes of potential new employees, before you hire them, or does it take you a few months to find out? This incredible skill can be developed to transform your business by creating a great team, not a bunch of staff who don’t give a stuff (staff). Other facets of people skills include leadership and managing employees based on their unique needs, which are strongly determined by their DISC profile. This is a huge subject but let’s get on the next one. The next skill of measuring has been discussed previously. This skill isn’t something you can learn yourself, you need professional and expert assistance and training with numerous spreadsheets for your business that have been refined over many years. Many businesses measure finances, but measuring production weekly and your gross margin from that is the most powerful form of measuring there is! This is what the Academy of Business Mastery attendees learn in great depth, with customized to their industry measuring tools supplied for their specific industry and business. This method of measuring gives you the ability to control your Net Profit Margin, before you win sales, during the production and after the job has been completed and paid for (finances). How would you like to know you are making an excellent profit, before you even win the work? With measuring you can also price all work/jobs/products/services with a minimum Gross and Net Profit Margin. This is incredibly powerful and should be the primary aim of your business and management. Until you can do this effortlessly so you have a system of pricing with a Net Profit Margin, how can you step out of your business and let someone else run it and price everything instead of you? The answer is – you can’t (unless you’re a retailer or one of the minority service businesses)! You probably won’t trust anyone else to do it. Did you know business owners tend to have an issue with trust, which is primarily due to their undeveloped people skills? Trust of staff can be learned as some people are extremely trustworthy and some aren’t. Can you pick the difference rapidly, accurately and on the phone (before you hire or even interview new potential employees)? The last primary skill of business is learning systems. Are you aware of what an induction system is, and do you have them for all positions in your business? Few business owners do, yet its one of the most powerful and beneficial types of system there is. The MOST important system in a business is a full recruitment system to hire great attitude staff who work as hard as you do, are keen to learn, think for themselves and enjoy responsibility. When you have this system you don’t hesitate to put off poor performing or bad attitude staff. Without this system you put up with them thinking you can’t replace them. Then you get frustrated with them and end up taking on their responsibility because they can’t think for themselves and then you have no time. See the vicious cycle? There are 9 systems categories you need to systemise in a business. You can systemise a business 80%, but you need to humanise it the other 20%. This means you need to have your staff working together, as a team, getting together once a week to review their KPI’s, talk about their week and to discuss the need or use of the systems. Just like a team sport, the coach can’t explain every specific way each player has to play with another player. The players who play next to each other have to figure out their working relationships, based on each other’s personality to create teamwork. This is the humanising side of systems. 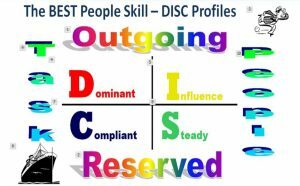 DISC Profiles play a major role in people learning to work with each other. It’s the most powerful people skill to learn and master there is! Have you learned about DISC Profiles? If so have you mastered them so you can pick the profile of 80% of your potential customers in 30 seconds, on the phone? Not being able to do this means you’re missing out, greatly. If you can do this, how about all of your team? Can ALL of them do this as well? When all of your team, who communicate with customers at any time, can pick the customers’ DISC profile, now you are operating an extraordinary business that will generate a flood of customers, for zero cost. What can that do to your net profit margins? Combine all “3 skills” and you are now beginning to master management. There is incredible synergy to be had when you master all 3. Your whole business and life changes! You become less stressed, remove frustration with people at work, start to free up your time and reduce the pressure on yourself as your team start to shoulder it too, plus your profits go up as you become far more efficient. What happens is your numbers from your spreadsheets get fed into the weekly team meetings, which generate discussions on refinement of the systems, which keeps liberating higher profit margins, which liberates surplus money for you and the business to keep growing… virtually effortlessly! That’s the number one aim of effective business management and something you should focus every moment of your time at work on… no matter how busy you are, because the rewards are LIFE changing!